If you think the Migratory Bird Hunting and Conservation Stamp, commonly called the Duck Stamp, is just for waterfowl hunters, think again! Whether you like to hunt, bird, photograph wildlife and scenery, collect stamps, or conserve habitat, you’ll want to purchase this stamp. When you buy a $15 Migratory Bird/Duck Stamp, as much as $14.70 goes to the Migratory Bird Conservation Fund, which supports wetland acquisition for the National Wildlife Refuge System. More than 250 of this country’s 560 refuges have tapped these Migratory Bird Conservation Fund dollars to secure refuge property. This is vital for birds and other wildlife and expands outdoor recreational opportunities such as hunting, fishing, bird watching and photography. Each year, the sale of the stamp raises about $25 million to provide critical funds to conserve and protect these wetland and grassland habitats for the benefit of wildlife and the enjoyment of people. The Migratory Bird/Duck Stamp functions as a federal license to hunt waterfowl for anyone over the age of 16 and provides free admission to any refuge that charges an entry fee. Since 1934, stamp sales have helped raise over $850 million for the Migratory Bird Conservation Fund to acquire and protect more than 5.5 million acres of wetland, grassland, and riparian habitat on National Wildlife Refuges across the lower-48 states. The habitat derived from stamp purchases, support not only ducks, but also many species of shorebirds, long-legged waders, raptors, and wetland and grassland songbirds. The Migratory Bird/Duck Stamp (and Junior Duck Stamp) is sold in many post offices across the country. 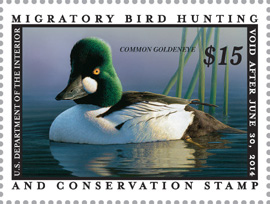 You can also buy both stamps at www.duckstamp.com, and at many National Wildlife Refuges, sporting goods and outdoor stores. Don’t wait. Buy your stamp today! The 2013-2014 Migratory Bird/Duck Stamp features a lovely male Common Goldeneye painted by wildlife artist Robert Steiner of San Francisco. For more information about how you can help support the growth and appreciation of the Stamp, visit the Friends of the Migratory Bird/Duck Stamp website.